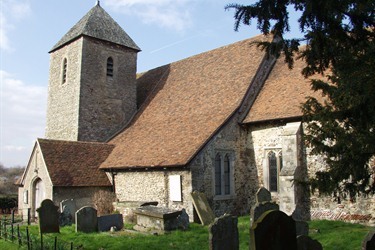 St Margaret of Antioch is a much loved and well used 11th century village Church full of history, situated on the banks of the river Medway. Our ancient font has been in use for over 8oo years, and still in regular use today. Some wall paintings and other item of historical significance. A history of the village and church are available in the church. We have a range of different services, ranging from a Book of Common Prayer Communion service, using the traditional language to informal family communion services, which are suitable for all ages, and which include a range of activities for children. Our Welcome Service on the 4th Sunday is designed for anyone who has not been to church before - although everyone is very welcome. The Praise Communion is an informal evening service with time for worship, prayer and sharing our thoughts on the Bible reading for the day, together with a communion. The Church is also open every Saturday between May & September, from 2:30-4:30. Everyone is very welcome to join us for any or all of our services. Takes place on the 1st Saturday of the month from 9:30-11:30. Breakfast is followed by a morning of non-stop action, bible sharing, craft, art and activities, all on a special theme for the day, and all of it FUN! Breakfast Club+ is open to all 5-11 year olds. Find out more from Jackie Swift on 01795 842749.